← What do 2 Faithful and a Priest equal? Truly some of the more exciting news for today. This was verified by several news sources. This entry was posted in Miscellaneous and tagged 8th Ecumenical Council, Eastern Orthodox, Ecumenical Patriarchate. Bookmark the permalink. took the bait did ya? How long did it take before you realized it was not all it claimed to be? Yeah, I fell for it too! 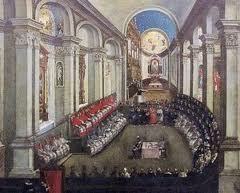 With respect to his holiness, it is his right and prerogative to call a council of all the Church. However, it is not he that gets to decide if it is an Ecumenical Council. Of course it has to be received by the people, I think they like the crowns as they are and I doubt they will pay a more just price for Prosphora. Καλη Σαρρακοστη! Man proposes and God disposes. An eighth council I would not worry, or hold my breath. Let us cooperate with grace that God gives us today, let us really hear the Goodnews/the Gospel and share it with others, and the things we cannot control, let us let go of.